Good evening everyone and thank you so very much for coming tonight – here we go again! This is the third one of these speeches I’ve made in the past four years, and I continue to be humbled by the support of all of the amazing people in this room. Some of you have been there from the beginning like mom & dad, even though I think even they were part of the many telling me I was crazy to embark on this journey back in 2013…But look at how far we’ve come! When I took office three years ago, New Britain was a very different place than it is today. The City’s finances were bad, a deficit of almost $30 million dollars and letters from the creditors were piling up. All around town, storefronts were vacant, buildings were left to crumble. Homelessness was rampant and on full display in Central Park. Our school system was being used as a punchline and our youth…and, frankly, many of us…had lost the pride we should all feel in our hometown. Well, all I can say is, what a difference two terms makes. By working together, with a spirit of bipartisanship and shared purpose, we have transformed our community from one that we doubted ourselves, to one that has been nationally recognized as an All- America City. We’ve made a lot of news in the last 1165 days that we’ve been in office. Some good, some bad, some more interesting than others…. When I first ran for Mayor, I talked about the need to bring a “New Generation of Leadership” to New Britain…and, thanks to you all, we did just that. When I ran for re-election in 2015, I said that we were “Setting a New Standard” for what you should expect from your government, and I believe we have. Tonight, I want to talk with you about a City that is “Leading the Way,” not just for our residents, but for cities and towns around the state. Unlike some other Connecticut cities who are looking to be bailed-out either by the state or by their neighboring communities, we in New Britain have done much more than merely admit that there was a problem…we put together a comprehensive plan to address those problems and we made the decisions necessary to restore confidence in our City. We didn’t sit here and cry wolf when we realized we were in it pretty deep, we rolled up our sleeved like the blue collar working class our city is and we did what needed to be done to get us out of the mess we were in. The New Britain today of 2017 is VERY different from the New Britain I took lead of it in 2013. All of you here tonight helped us establish a new generation of leadership, which enabled us to set a new standard and now we are proving that it is us who will lead the way forward. And for THAT we have a city today that is stable, proud, and prosperous! During the past two years we have aggressively moved forward with our downtown streetscape makeover, including the complete renovation of Central Park. What was an eyesore three years ago is now the sight of weekly farmers’ markets, food trucks, concerts, and a safe & open gathering place that is drawing folks to our City center. Our next phase involves major improvements on Columbus Boulevard and Bank Street – as well as the start of a project that is very close to my heart: the new, iconic, Beehive Bridge. We have been nationally recognized for our creative efforts in improving our roadways. But Infrastructure doesn’t mean just roads; We are upgrading our aging school facilities so that our children can leverage educational resources that are second to none and continue to compete at the highest academic levels. Our last major project was a complete renovation of Gaffney School, and next on the list: Smalley Academy where we hope to break ground by the end of the year. One of the key items that people look at when gauging the vitality of a city is whether businesses want to be there…. let’s talk about “Leading the Way” in economic development. First off, we’ve streamlined our process. No longer does a prospective business owner get bounced around City Hall, department by department, the red tape is gone. We’ve brought in over 65 new businesses and added over 800 jobs to our workforce. Our grand list has grown for three straight years in a row in tough economic times. And we are about to embark on a project set to be the largest downtown development in recent history – where the former New Britain Police Department building stood will soon be the site of a $58 million mixed-use development bringing retail, restaurant and residential space to a key area just adjacent to CTFastrak. Say what you will about CTFastrak but the hundreds of people I see getting off those busses every day is exactly what we have capitalized on to leverage state and federal grant money to make all of these visions a reality. We are now in a place where we can be picky about the types of business we want in our city, no longer do we settle for just anything because its something, but we have the opportunity to choose. We have new private housing developments emerging throughout the City as well – many investors are helping to refurbish and preserve our beautiful historic buildings. You can’t drive too far without seeing new development at every corner of the city. welcoming the Alverium Beer Company this spring. Alverium which means beehive in Latin. I’m proud of the marketing initiatives we’ve taken to promote ourselves as the home of the bees, in more way than one… Just next week we will be unveiling a new marketing logo and slogan for the city which will help promote us far past our city limits…and its helped us realize that our limits are endless.. Especially when we talk about “Leading the Way” in innovation. Our Smart City Initiative has seen us add one of the state’s largest municipal solar arrays; we have brought free public WiFi to our downtown area and we have embraced fuel cell technology at the high school and we have plenty of projects currently in the pipeline. We’re leading the way in green technology. A city can’t attract residents or businesses without stable and predictable financial management, we are “Leading the Way” when it comes to managing our money. I mentioned that we had a structural deficit of $30 million when I took office. Today, we have closed that gap and built a rainy day fund of nearly $15 million, which will come in quite handy when the State Government inevitably cuts municipal aid or shortchanges us on PILOT funds like they usually do. We also accomplished the unthinkable: moving every one of the City’s labor unions onto high deductible health care plans, as well as securing numerous other concessions which are projected to save us more than $9 million over the life of the contracts. We found a way to protect the healthcare of our employees while preserving the city’s bank account. Our employees and union have stepped up to the plate to be a partner in solving our problems, and that wouldn’t have happened without good leadership. And I would be severely remiss if I didn’t give a heartfelt “thank you” to the people of this great City for their sacrifice; because we could not simply cut our way back to solvency…we have had to increase revenues as well. But I believe that I was elected to make the tough and often unpopular choices. I know in my heart that they are the right choices for our long-term health and stability. I didn’t think that after that first year I’d be standing here today going into my fourth year. I thought I’d be a goner. But in a strange turn of events, people actually appreciated someone who was honest with them through the hard times…and for that I will always be able to look myself in the mirror and feel good about the person that I see. It’s what keeps me humble, and that leads me to remind you all how we are “Leading the Way” when it comes to compassion. Three years ago, New Britain was nearing a crisis, with a chronically homeless population nearing 200 individuals. While we have always had many wonderful groups, agencies, churches, and individuals wanting to help, there was no coordination between them and, as a result, the resources were not getting to those who needed them the most. We brought back the Mayors 10 year pan to end homelessness and re branded it Building Hope Together, a consortium of City, community, state and faith-based entities and collaboratively built a model that is unique to New Britain….and, I’m so proud to say, we have brought our chronically homeless number down to 0. As you all probably know, I do a lot of traveling around this state and everywhere I go people cannot contain their amazement at the progress we have made in just three short years. But – I’m not done yet – everything I’ve mentioned tonight must be sustained. In order to make this City what we all know it can be we have to push ourselves. It’s a team effort and I wouldn’t be successful without the team. My team of aldermen who have done incredible things in the last two years, they deserve another shot too! And I’d be lost without my campaign team, thank you to all of them and our volunteers who made tonight possible especially Mailene my trusty event planner! Please stand up, wave your hand and let us recognize you all! I have decided to seek reelection because I care deeply about my hometown, my beehive. I’m 110% committed to the City of New Britain. We may not be rich, but that’s what makes us who we are, that’s what makes us unique, when we don’t have the means, we make do. We’re defined by our tenacity – we never give up. We will be a story of success. New Britain must continue “Leading the Way” and, as your Mayor, you know that I will never give up. From the bottom of my heart, thank you for being here and for your continued support. 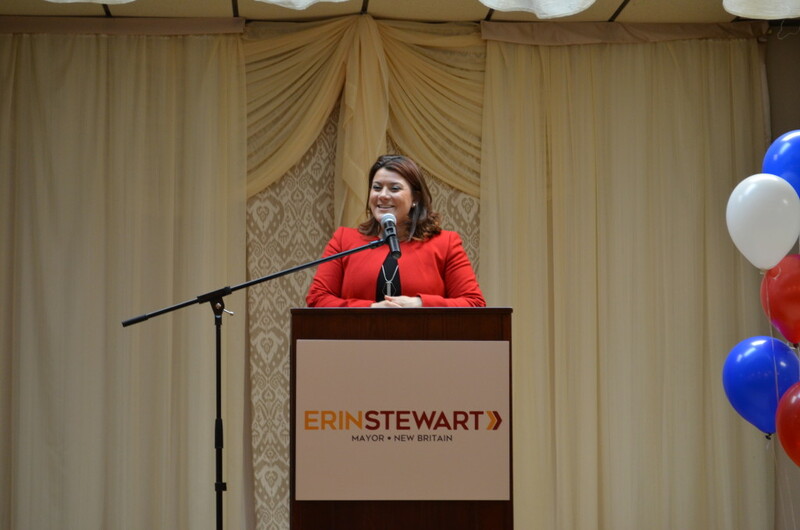 I promise to continue earning your trust – and, eventually, your vote – it’s a long way to November, but the work starts now and that is where I call on each one of you to help tell our story of Team Stewart success! We will cover this city with our message – every voter in town will know that our Team is fierce, that our team is dedicated, and there will be no one standing in our way because we’ve come too far these last three years to turn back now! Thank you all for your support lets hit the campaign trail!